Avocado chip (front): These were sweet moist muffins studded with Nolan’s go-to chocolate chips, a nice minty green in color. He gobbled them down with no hesitation. Spinach-romanesco with feta (back): Savory egg muffins like crustless quiches. The moist texture of eggs is rather beyond Nolan at this point; this was breakfast one day for the rest of us. Not shown: Romanesco chocolate chip, a sweet muffin using spring green romanesco cauliflower as a base along with pea protein. These were moist and had no flavor of vegetables; Nolan ate several of them. 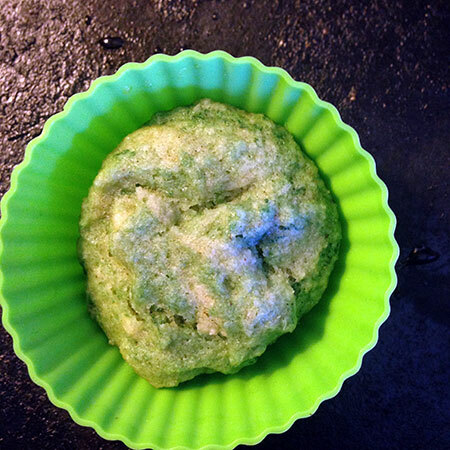 Taro-almond: This was an initial experiment to see if liquid chlorophyll would make a good natural food coloring for steamed muffins, made using a taro-almond batter for monkey bread. Nolan didn’t have a chance to try the green version because Theo gobbled my tester, but he liked the chocolate-hazelnut monkey bread version. 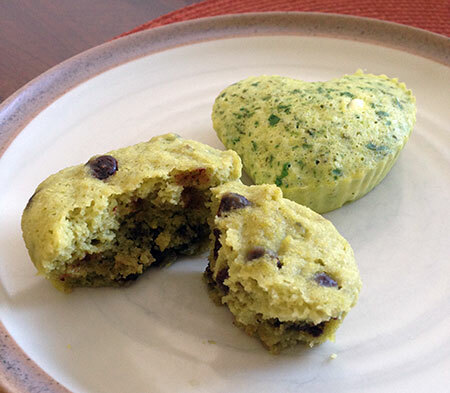 Matcha-mint: These dense muffins were scented with cacao butter, matcha tea powder, and peppermint stevia (and of course the obligatory chocolate chips). 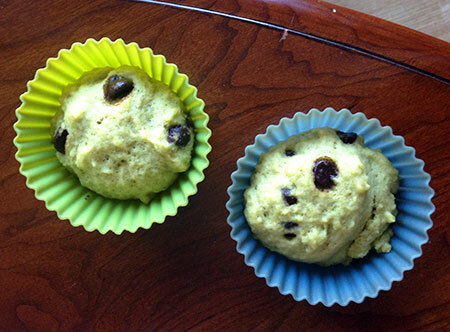 Both boys loved these muffins; I avoided them because peppermint can be hard on milk supply. Cashew chip: This batter was based on the cashew waffles at Against All Grain. The green swirl is just 3 drops of chlorophyll swirled through the batter with a knife, and once again, Nolan didn’t mind the color at all. Spinach-banana chip: These almond butter-based muffins contained a little banana and a lot of baby greens (I used a super-spinach blend that included kale and bok choi). The greens contributed color but no discernible flavor, and Nolan ate them just fine. 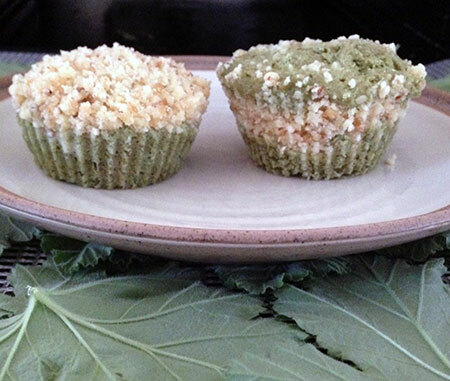 Sweet pea and green apple: These muffins honestly made me a little nervous because they used an odd combination of produce combined with hemp and amaranth, which both have very grassy flavors to me. The peas and apple were steamed before pureeing, and after my microwave test-muffin, I added a bit of coconut flour for body. 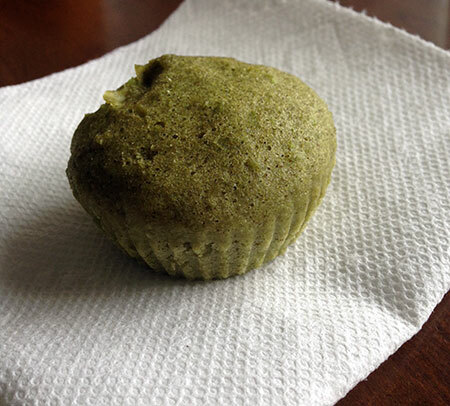 Where the batter was a solid green pea color, the finished muffins are more of a camo green (maybe because of the hemp? ), with a soft fluffy texture and a mild grassy flavor balanced by ginger. 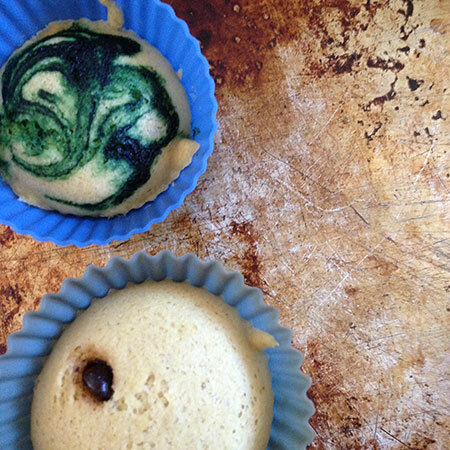 Banana-cream cheese chip: I wanted a nice pale muffin as a canvas to try my hand at making a swirled design with chlorophyll, and banana chocolate chip is one of Nolan’s favorite flavors. This batter with whey protein and water chestnut flour fit the bill nicely, although the chocolate chips got in my way a little bit. 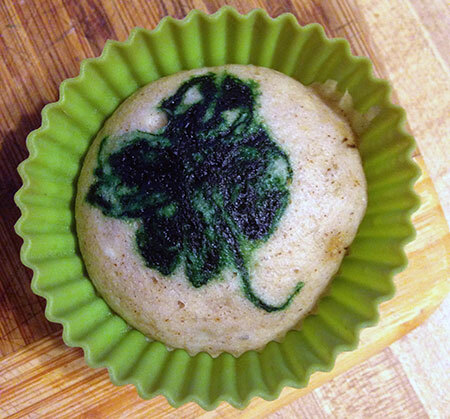 I used 4 drops of liquid chlorophyll, and swirled them in the top of the batter with a toothpick. 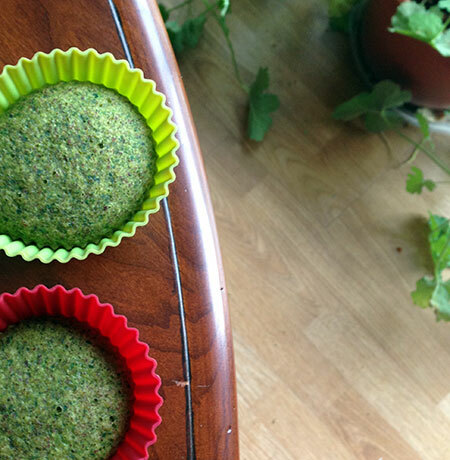 These muffins represent just a few of the ideas I had for naturally green muffins. Since Nolan responded so well to most of them, I’ll have to keep playing around with options like green split pea, spirulina and/or chlorella, sunflower butter mixed with baking soda, greens powders, more vegetable purees, and more. Love finding ways to sneak variety into his diet!